Recently, efforts have been increased for the rapid identification of microbiological samples to improve health diagnosis. Existing methods require pre-treatment of the sample and extended times. For these reasons, the Laser Induced Breakdowns Spectroscopy (LIBS) technique has been proposed as an alternative method to reduce bacterial identification times. 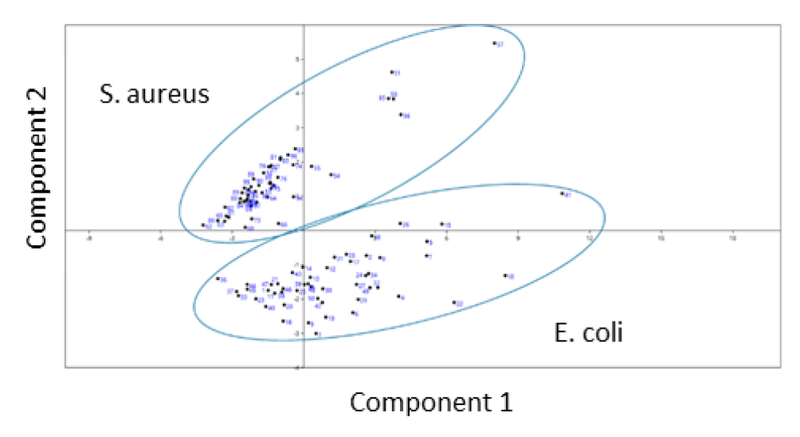 In this work, spectra were obtained from two types of bacteria: Escherichia coli and Staphylococcus aureus, their elemental identification, as well as the use of an artificial neural network for classification among them. As a source of excitation, a compact laser was used in the Q: Multi-pulse switch, which favors the intensity of the plasma emission and facilitates detection. The results presented show a clear identification between the two types of bacteria. RENDÓN-SAUZ, F. G.; FLORES-REYES, T.; PONCE-FLORES, A.. Rapid Classification of Bacteria Using LIBS in Multi-Pulse Laser Regime and Neural Networks Processing. Revista Cubana de Física, [S.l. ], v. 35, n. 1, p. 10-14, july 2018. ISSN 2224-7939. Available at: <http://revistacubanadefisica.org/index.php/rcf/article/view/RCF_35_1_10>. Date accessed: 19 apr. 2019.